Wright is committed to maintaining the highest standards of ethical conduct and to strictly comply with the guidelines, rules, and regulations that govern our business practices. 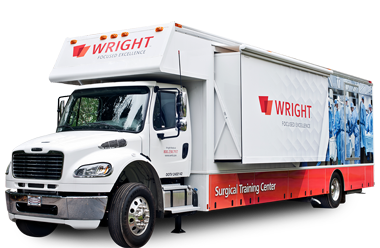 Wright’s corporate responsibility to drive the core values of integrity, ethical behavior, professionalism, and trustworthiness, allows us to demonstrate our commitment to compliance excellence and exemplary corporate citizenship. PRESIDENT AND CHIEF EXECUTIVE OFFICER, WRIGHT MEDICAL GROUP N.V. Assists the Board in overseeing the corporate governance processes at Wright. Oversees the global Compliance program at Wright. Cross-functional team responsible for monitoring activities across the business to ensure consistent and compliant practices. Reviews all grant requests from outside organizations against a series of guidelines as established by Wright. Responsible for Health Care Professional Consultant royalty decisions worldwide on an ongoing basis. Reviews and approves all service need requests generated by the functional areas during the Needs Assessment Process. Reviews the qualifications and compensation of all of Wright’s existing (reviewed annually) and proposed new Health Care Professional consultants to determine if those qualifications meet specific Health Care Professional consulting needs and fair market value rates. Everyone associated with Wright is responsible for complying with our Code of Business Conduct and the Company’s related policies and procedures. If you learn of, or suspect, a violation of the Code, related policies or procedures, or applicable laws and regulations in connection with the conduct of the Company’s business, you must report that information immediately. No individual making a good faith report will be subject to retaliation. Wright consistently strives to provide responsive support and to deal with our customers in the most fair and ethical manner possible. Should you have questions or concerns about an ethics and/or compliance issue, or have questions about our compliance program, please contact Wright’s Chief Compliance Officer. You may also contact Wright’s Ethics Hotline at (901) 867-4349 or email [email protected]. The Advanced Medical Technology Association (“AdvaMed”) is dedicated to the advancement of medical science, the improvement of patient care, and in particular to the contribution that high quality, cost-effective health care technology can make toward achieving those goals. In pursuing this mission, AdvaMed members recognize that adherence to ethical standards and compliance with applicable laws are critical to the medical device industry’s ability to continue its collaboration with health care professionals. Consequently, AdvaMed adopted this voluntary Code of Ethics, effective January 1, 2004 and revised and restated with an effective date of July 1, 2009, to facilitate Members’ ethical interactions with those individuals or entities that purchase, lease, recommend, use, arrange for the purchase or lease of, or prescribe Members’ medical technology products in the United States. Without reservation, Wright strongly endorses both the letter and spirit of the AdvaMed Code of Ethic. MedTech Europe is the European trade association representing the medical technology industry, from diagnosis to cure. It represents diagnostics and medical devices manufacturers operating in Europe. MedTech Europe’s mission is to make innovative medical technology available to more people, while helping healthcare systems move towards a sustainable path. MedTech Europe encourages policies that help the medical technology industry meet Europe’s growing healthcare needs and expectations. The association also promotes medical technology’s value for Europe focusing on innovation and stakeholder relations, using economic research and data, communications, industry events and training sessions. MedTech Europe started as an alliance in October 2012 formed by two organizations – EDMA, representing the European in vitro diagnostic industry; and Eucomed, representing the European medical devices industry. Members of MedTech Europe approved a new Code of Ethical Business Practice in December 2015 to set high ethical standards for the medical technology industry across Europe. The MedTech Europe Code of Ethical Business Practice (the Code) regulates all aspects of the industry’s relationship with Healthcare Professionals (HCPs) and Healthcare Organizations (HCOs), such as hospitals and clinics, including company-organized events, arrangements with consultants, research and financial support to medical education, amongst others. It also introduces an independent enforcement mechanism. The Code aims at ensuring that all interactions between companies and HCPs and HCOs are ethical and professional at all times, and beyond criticism to maintain the trust of regulators and, most importantly, patients. MedTech Europe is committed to promoting legitimate and ethical business practices and encouraging responsible and ethical interactions with HCPs and HCOs. Without reservation, Wright strongly endorses both the letter and spirit of the Code. Canada’s Medical Technology Companies (“MEDEC”) is dedicated to advancing healthcare through innovative technologies, devices and diagnostics (“technologies”). MEDEC believes that access to high quality, cost-effective healthcare technology is paramount to the improvement of patient care. MEDEC represents companies that design, develop, manufacture and market medical technologies and related services used in the treatment, mitigation, diagnosis or prevention of a disease or abnormal physical condition. In pursuing this mission, MEDEC member companies (“Companies”) recognize that adherence to ethical standards and compliance with applicable laws is critical to the Canadian medical technology industry’s ability to continue its collaboration with Healthcare Professionals. Companies encourage ethical business practices and socially responsible industry conduct related to their interactions with Healthcare Professionals. Companies also respect the obligation of Healthcare Professionals to make independent decisions regarding Company products. MEDEC supports and respects the guidelines and policies established by professional societies or organizations that outline the obligations of the profession, while interacting with the Canadian medical technology industry. Without reservation, Wright strongly endorses both the letter and spirit of the MEDEC Code of Conduct.